As part of its effort to revive interest in the English journalist, travel writer, and biographer (of Aldous Huxley), Counterpoint plans on reprinting her four novels, beginning with this, her first, from 1956. A new and amusing introduction by Bedford records the agonizingly slow composition of the story, set in pre–WWI Germany, mostly before her own birth in 1911 in Germany. The novel’s pitiable reception was redeemed by one glowing review—written by Evelyn Waugh, who no doubt would have agreed with Kirkus that Bedford’s tale of interfaith marriage was “tantalizing.” A few families—one urban and Jewish, two from the agrarian, catholic South—become “tangled” (to use Kirkus’s words) and “the secret of an earlier, unpleasant tragedy-laden event” is revealed. 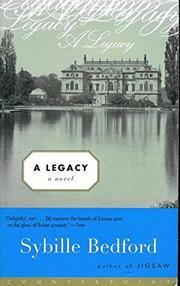 A personal history seen mostly through a child’s eyes, the story “twists” and “twines” and “decorates conflicts within and without a Prussian tempered era for an obliquely viewed gallery of the times.” Though Bedford acknowledges the personal history involved, her debut fiction surely stands on its own fine merits.